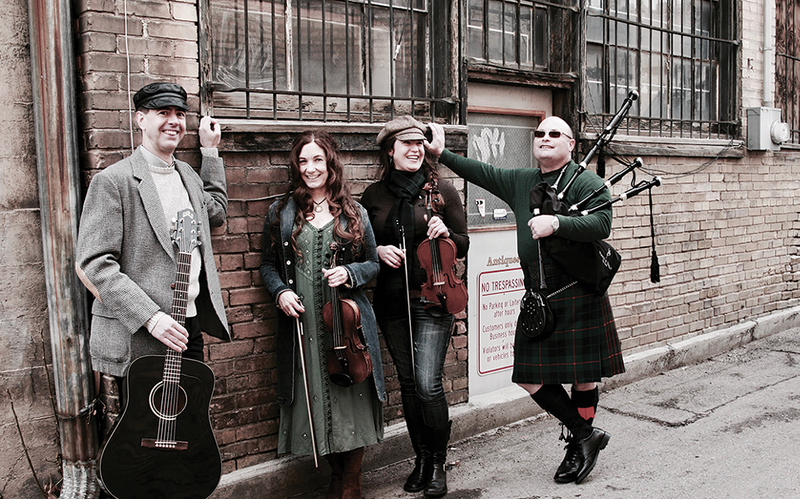 Celtic mainstays Shanahy reunite to kick March off right at IAMA's Local Concert Series. With February in the rearview mirror and the calendar changed to March, we've got plenty to look forward to: warmer temperatures, less snow, longer daylight hours. And, for those of us who are so inclined, St. Patrick's Day, the Irish cultural and religious celebration commemorated in more countries than any other national festival. Good tidings and green beer are only the tip of the iceberg, however. March unleashes a cavalcade of Celtic music in and around Salt Lake Valley. And on the first day of the month, the Intermountain Acoustic Music Association's Local Concert Series takes listeners on a journey to the British Isles. Opening the show is Pennyland, named after the Anglicized word for the amount of land a Scottish tenant farmer or crofter could rent for one penny a month. Formerly known as Annie's Romance, Pennyland today pays tribute to the Scottish crofters who, dreaming of better opportunities, crossed the Atlantic to settle first in Cape Breton and Nova Scotia and eventually, all over North America. The big draw on March 1, however, is a reunion of Shanahy, one of the longest-running ensembles in Utah. Like Pennyland, Shanahy—made up of Kate MacLeod, Andrew Morrill, Bronwen Beecher and Mark Hazel—don't limit their creative output just to Irish music. Yes, they explore traditional forms of music from the British Isles played on fiddle, highland pipes, cauld wind pipes, uilleann (Irish) pipes, whistle, flute, bodhrán and guitar. But in addition to traditional jigs, reels, strathspeys, waltzes and airs, Shanahy injects a fair bit of contemporary influence into their songs. "We are all specialists in Celtic music," MacLeod says. "Andrew, our bagpiper, is from a long line of family members who've passed the instrument down through generations, which is not unusual. I've played Celtic fiddle since I was a teenager, too, although I studied classical violin. But we all love playing the music together as Shanahy, even if we only do it in March and now and then at festivals and weddings in the summer." Although each of Shanahy's members has a thriving individual career, as a group they have released three albums: Trip to Ballymena,Far Away andA Fair Land Lies Before Me.In addition, MacLeod and Beecher are well known as instructors, which jives with the IAMA's mission to serve musicians and music lovers throughout the Great Basin and Rocky Mountain region. Each Local Concert Series event is usually preceded by an instructional session; on March 1, Steve Lewis leads a free harmonica workshop crafted to the level and interest of those in attendance. MacLeod has also taught annual songwriting workshops for IAMA. "Some of my friends started the organization as the Intermountain Bluegrass Music Association in the '80s," MacLeod says. "It's morphed and changed over time, becoming more inclusive. But it's still very supportive of local acoustic musicians, giving them an environment to play in that's not a bar and doesn't fit in with what mainstream audiences may be looking for." That environment is fan friendly: South Valley Unitarian Universalist Society in Cottonwood Heights welcomes listeners of all ages. Outside food, beer and wine are OK, while intimacy and interaction between audience and performer is encouraged. "A lot of people who are involved in music tangentially come to these concerts," MacLeod says. "Maybe they don't play music now, but at some point most of them had a music experience that made them love it. Maybe they're grown-up hippies or they were in a band when they were young. That allows them to enjoy these concerts in this whole other underground, non-commercial way." In fact, the exchange of money at IAMA events flows directly to artists, who receive 100 percent of proceeds from Local Concert Series ticket sales ($7 for IAMA members; $12 for non-members). "That's rare for us," MacLeod says. "That's why we musicians consider it one of the best performance opportunities in the state. In addition, the IAMA gives a lot of musicians the chance to intermingle more than they normally would. Since I don't love one style of acoustic music more than another, I've always liked the way it gives us a bigger network." That network continues to expand, even if Celtic music is only played during a small slice of the year. MacLeod moved here 30 years ago to study violin making; reflecting on how many other music community icons ended up here in much the same fashion, she laughs and says, "We call it Little Cremona," recalling the Italian city famed for its violin making. MacLeod says that, for her, Celtic music is a personal passion but a professional hobby. "I only say that because 90 percent of the time, I play my own music on tour outside the state. I'm not a native of the British Isles, so for me it's a little bit more authentic to claim that I'm an American musician. I perform Celtic music in this region because I love the music." Talking about the roots of the word "Shanahy," which has several spellings but is generally considered a translation of storytelling or storyteller, MacLeod offers an eye-opening anecdote: "Celtic music is encouraged, passed down, organized and kept alive in a very different way than other types of music. In Ireland and Scotland, music allows people a way to feel good. To them, that's a beautiful thing. It's not culturally disposable." Recalling a night in a country pub in a small Irish town, she says, "As an American, you always assume that Celtic musicians are just tolerating us. But one night, I got invited to perform at the late session, which didn't start until midnight and went on until 3 a.m. The musicians were people in the community: farmers, retired people. But to close the session, the elder started to sing 'We Shall Overcome.' I was a kid on the East Coast during the civil rights era, and that song almost became sort of a cliché. But hearing this Irish man sing it in the context of his own world and his people's troubles, it shocked me. If you sing a song and really mean it, it's not a cliché. Music is still about people, and you realize that when you go places where it's a traditional part of people's daily lives. That's what I love about Celtic music. We've lost that in our modern commercial world."